Share Your Favourite Song From 2018 on Facebook or Twitter With #AmazonBestof2018 and tag Amazon Prime Music handle. Done !! 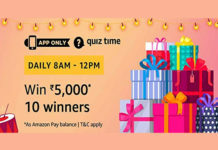 Get Rs 100 as Amazon Pay Balance, will email you the details. Note: First 20,000 participants. Terms and conditions apply. Amazon’s employees, their immediate family members (spouses, parents, grandparents, siblings, children and grandchildren), and their affiliates, advisors, advertising/Contest agencies are not eligible to enter the Contest. 1. This Contest will commence on December 22, 2018 and end on December 26, 2018 (both days inclusive) (“Contest Period”). 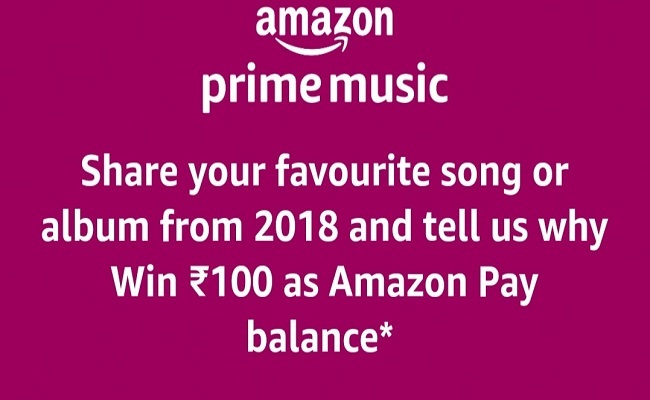 (iv) Tag (using ‘@’) the Facebook page AmazonPrimeMusicIN / Twitter handle AmazonPrimeMusicIN of ‘Amazon Prime Music’. 1. Amongst all participants, first 20,000 participants who complete the above steps, i.e. 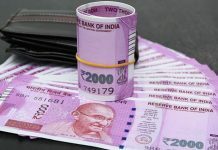 make the post as described above, will be eligible to receive a reward of INR 100 each as Amazon Pay balance (“Prize”). 2. 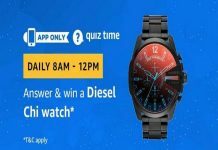 Each winner will be eligible to win only 1 Prize under this Contest.